Six times Master of the Skinners' Company, Mayor of Calais and of London, Merchant Adventurer and Knight, Sir Andrew Judde was a man who took financial risks, grew wealthy and founded in Tonbridge one of the foremost public schools in England. 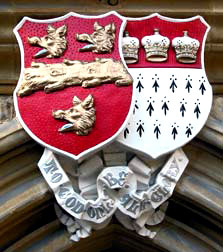 The Judde arms, with boars' heads, and Skinners' Company arms, with ermine, are displayed above the Porter's Lodge entrance to Tonbridge School. Judde (also often spelt Judd) was born about 1492, the youngest son of a significant Tonbridge landowner John Judde, whose lands were mainly to the south of the Medway, including Barden Park. His elder brothers inherited most of the estate, so Andrew went to London to seek his fortune. 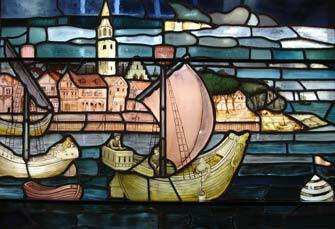 He was apprenticed between 1511 and 1517 to John Buknell, a man involved in both the fur trade, as a member of the Skinners’ Company, and the wool trade as a merchant of Calais – then a strategic port in English hands. Kentish wool was exported there and bought by foreign buyers, so that merchants of the 'staple’, as Judde became in 1517, benefited from the profits in trade and in currency exchange. Wool was not the only commodity traded through Calais. Sir Andrew’s name was also linked to trade in gold dust from Guinea, imports of oil and later also the fur trade with Russia. In 1533 he became Master of the Worshipful Company of Skinners, an annual post he was to hold six times. In 1550 he became Lord Mayor of London, when he was involved in a variety of problems ranging from the high price of larks to cases of treason. He was knighted by Edward VI at Westminster in the following year. In his public life Sir Andrew attracted the favour of both Edward VI and Queen Mary despite the swing from Protestantism to Catholicism, through his overriding loyalty to the Crown. In spite of being nominally a Protestant, in Mary’s reign he was active in defending the city from Wyatt’s anti-Catholic rebellion. In 1553 there were two exciting developments in the life of Sir Andrew Judde. The first was that he received a charter from Edward VI to found a school in Tonbridge. Perhaps wishing to invest some of his wealth for the benefit of the town in which he grew up, he bought 30 acres of pasture land known as ‘sand hills’ just to the south of St. Pancras in London. The rents from this land were to provide funds for the new Tonbridge School, raising the sum of £13: 6s and 8d in 1558. Later, as this land was developed for housing the rents increased substantially, enabling the Skinners’ Company, who took over the management of the charity and governorship of the school on Sir Andrew’s death, to add to the Judde foundation a Workhouse (1720) and three more schools, including the Judd School in Tonbridge (1888) and Skinners’ School in Tunbridge Wells (1887). The original foundation stone of Tonbridge School has been preserved and is now mounted above the Headmaster's Entrance. At its foundation, Tonbridge School was to be free, boarding and a grammar school. The last condition meant that the ‘three tongues’ of Latin, Greek and Hebrew should be taught. Another condition was that the school should be close to the Parish Church for regular worship and as Sir Andrew did not own land near enough, it is thought that he rented or bought land from his nephew Henry, who had just inherited land called ‘Houselands’ close to the centre of Tonbridge. The school opened there in 1553 with just 16 pupils, but now there are a total of about 3,200 children educated in Skinners’ Company schools. The second important event in 1553 was the despatch of an expedition by the Merchant Adventurers Company of London, of which Sir Andrew was a prominent member. He and others financed the expedition to look for a north east passage through the Arctic to Asia, and to find new markets for English wool. Two of the three ships were lost near Lapland, but the third drifted by accident into the gulf of Archangel and its captain, Richard Chancellor, went on to make the difficult overland journey to Moscow to meet the tsar, Ivan the Terrible. He had with him a letter from the King and from that year the trade with Russia began and the Muscovy Company was created. Richard Judde, Sir Andrew’s son, was with Chancellor on his second expedition to Russia. On that occasion two of the four ships were lost which, with the first expedition, amounts to a less than fifty per cent rate of success. It was a risky enterprise but expeditions continued to be financed by the Company in which Sir Andrew played a leading role, and before long strict rules were drafted to improve safety and therefore the success of the expeditions. One expedition, to Guinea, brought back a rare trophy, the head of an elephant, which Sir Andrew kept in his house to show to visitors. 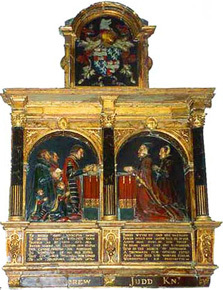 The Judde tomb in St.Helen's church, Bishopsgate. In addition to the Judd School, and Judd House at Tonbridge School, Sir Andrew’s name is commemorated by Judd Road in Tonbridge and Judd Street on what is now the Skinners' Company Estate in St. Pancras. > Copies of An Essay on the Life of Sir Andrew Judde (1849) by George Maberley Smith and Sir Andrew Judde (1953) by H. S. Vere Hodge are in the Local Studies Collection at Tonbridge Reference Library.